In an effort to protect against worker inhalation of harmful crystalline silica, new regulations have been set by OSHA. Jackhammer and other breaker tool applications are covered by the construction industry compliance regulation 29 CFR 1926.1153 with a start date of September 23, 2017. A wet suppression method is considered an effective tactic within a larger protective plan for a safer workplace. The wet suppression method involves spraying a constant flow of water at the breaker tool as it cuts through dust causing media. Rather than having a jackhammer operator as well as a water sprayer operator, an air and water spray system can be devised using a jackhammer hose paired with a water supply hose. Hoses can be paired together using heat shrink tape or zip ties, or a more permanent and professional solution is now available from Parker Industrial Hose. Twinhammer™ Jackhammer hose assemblies bond a 3/4 inch red air hose and a 3/8 inch blue water supply line. 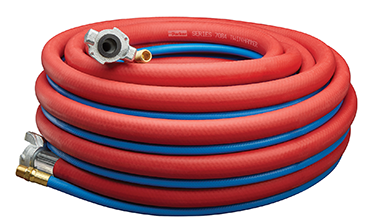 Both hoses are 300 PSI rated* domestically produced EPDM rubber, with factory crimped connections. The air hose has crimped universal / Chicago couplings and the water hose has crimped brass 3/8 inch male NPT couplings. Whether you choose to incorporate Twinhammer assemblies, retrofit your current hose assemblies, or use a two person system of sprayer and breaker, choose to safety and comply with these new regulations for a healthy workforce.